Getting Started: the all-important role that kitchens fill in family life – focusing on how to incorporate color trends into timeless kitchen design. Counters & Flooring: interior decorating trends relative to surface selections for kitchen flooring and countertops. Appliances: how appliances inform kitchen design. This week, in our final kitchen redesign post, we will concentrate on fixtures, such as lighting, faucets and hardware. Until the early 1900’s, sunlight was the only form of lighting for most kitchens, until the wide adaption of the incandescent light bulb, which brought the kitchen out of the dark. Through the depression and war years and for a time after, austerity prompted many homes to have only one lighting source, usually over the cook-top area. As the energy crisis hit in the 70’s, the move to more energy-efficient fluorescent became the trend. With so many styles and materials to choose from, you should start by examining the quality of the fixture – a faucet of solid brass construction will ensure its longevity. A few examples of available faucet-finishes, which are popular today, include brass, chrome, copper, matte finish, oil-rubbed metals, pewter, satin sheen or polished. With so many finishes and styles from which to choose, how will you know which direction to go? Your experienced design/build/remodeler will be able to steer you in the right direction. For example, if your tastes are more modern, you could consider touch-less or single-handled, streamlined, stainless or platinum faucets. Today, drawer pulls, handles and knobs come in all shapes, sizes and finishes. The potential options are as endless as your imagination and comprise various features that can alter the overall look of your kitchen. Whatever your aesthetic, the design-build approach used by Lotus Construction Group hones in on the perfect choice and enables us to create a work-friendly kitchen that fits within your home’s architectural context. When it comes to complex projects like custom homes, kitchen renovations, additions or whole-house remodeling, Lotus Construction Group uses cutting-edge materials and construction techniques, and offers innovative ideas executed with flawless precision for seamless flow and timeless design. We would love to visit your home to discuss how we might create a comprehensive Design-Build Analysis, specific to your project’s needs. If the process sounds enticing, call (909) 621-1558 today to schedule a complementary appointment. In our first blog post about kitchen remodeling, Kitchen Remodeling in Focus, we discussed the all-important role that kitchens fill in family life – focusing on how to incorporate color trends into timeless kitchen design. Last week’s post, Remodeling: Kitchen Counters & Flooring, covered interior decorating trends relative to surface selections for kitchen flooring and countertops. In this, our third entry in a four-part series, we’ll discuss kitchen appliances and how they relate to design and functionality. Next week, check back as we will tackle how fixtures inform kitchen design. In much the same way that avocado green, burnt orange and harvest gold were trendy appliance colors circa 1970, the 1980’s was all about white. 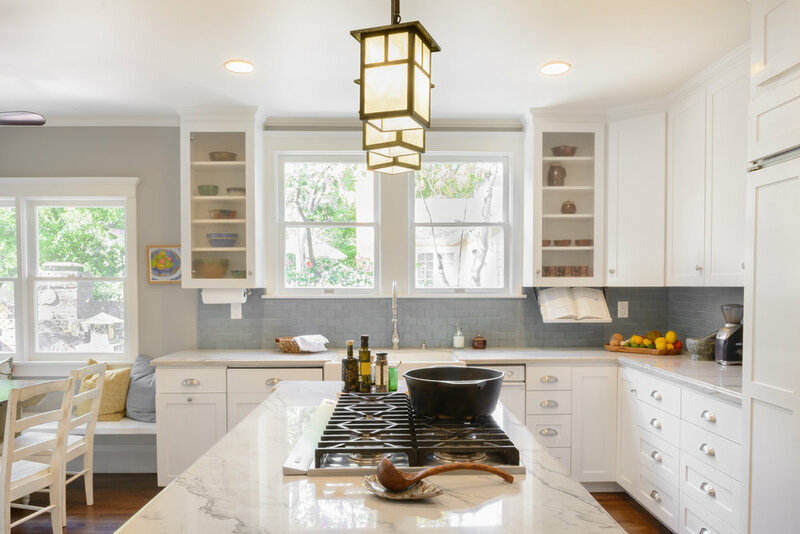 Thereafter, the 1990’s and early 2000’s inspired a love of stainless steel; in fact, almost every kitchen remodel during this period featured granite countertops and stainless steel appliances. Time marches on, and so do remodeling ideas – so what is on the horizon? Retro design sees kitchen appliances popping up in soft pastel colors with rounded-edges, such as these which appear on Big Chill. Additional retro appliance pieces are available on websites such as AJMadison and ElmiraStoveWorks. A great way to set the tone for a kitchen renovation is to choose appliances that reflect your personality and the way you want to cook. No matter your preferred kitchen aesthetic, an attractive hood is a great accent playing an important but supportive role to your cooktop. 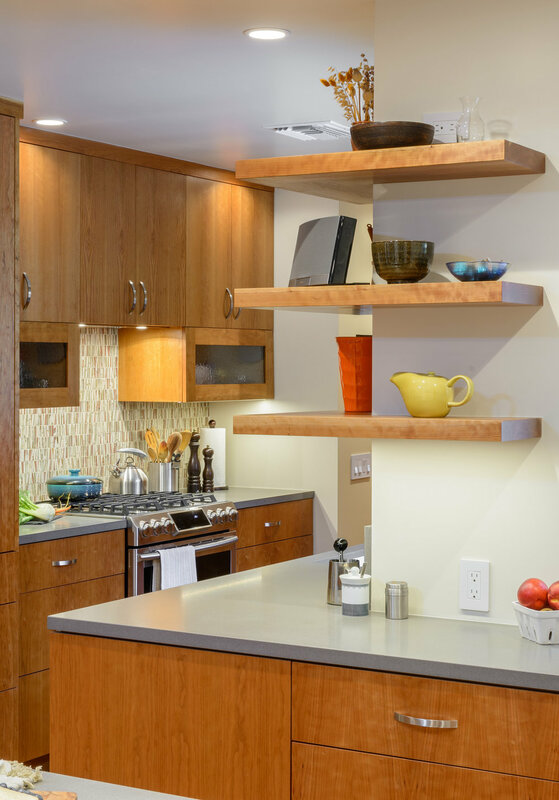 Smart home technology is rapidly developing, with the kitchen at center stage. As far as appliances go, you will soon see integrated speakers with Bluetooth functionality, color-changing lights, and integrated charging sockets. Smart Home appliances will not only look attractive but will make the most of available technology to improve kitchen efficiency. One of the most popular are smart refrigerators, which include smartphone mirroring, smart TV playback, memos, calendars and internet radio, and as a bonus, the Smart Fridge also chills food. Read the final post in our four-part series about kitchen design trends for 2017 focusing on fixtures. When it comes to complex projects like custom homes, kitchen renovations, additions or whole-house remodeling, Lotus Construction Group uses cutting-edge materials and construction techniques, and offers innovative ideas executed with flawless precision for seamless flow and timeless design. We would love to visit your home to discuss how we might create a comprehensive Design-Build Analysis, specific to your project’s needs. If the process sounds enticing, call (909) 621-1558 today to schedule a complementary appointment. In this second part of a four-part series about kitchen remodeling, we will discuss surfaces for flooring and countertops and provide you with some pros and cons of different materials. We've already covered how to incorporate color trends into timeless kitchen design. Check back next week for our final post in the series, about fixtures and appliances. History has shown us a multitude of flooring and countertop surfaces, from the linoleum and Formica of the mid-century, to the current day natural stone, tile and hardwood choices. The earliest counter tops were of wood or stone – think back to the old farmhouse table. In the 1800’s, soapstone and slate became more plentiful and developed into the standard for kitchen counters. Other stones were soon being used, but the great leap for materials happened after World War II with the housing boom. New and less expensive materials with a wider range of colors were introduced with laminates and stainless steel counters. In choosing the right countertop and flooring for your kitchen remodel, it’s important to take into consideration the way in which you use your kitchen and the type and amount of daily household traffic in and through your kitchen, so your remodel can be enjoyed for decades to come. This kitchen remodel features wood flooring as well as solid surface countertops. Durable hardwoods feature striking natural colors and richly-detailed grain patterns. Hardwoods reflect timeless design and versatility even when flooring trends change down the road. Over the long haul, hardwoods are cost-effective in that they can be refinished several times over the years bringing a fresh look each time, with minimal cost. We installed hardwood floors in a Pasadena kitchen remodel to compliment the Tudor style of the home. Sustainable and eco-friendly cork has quickly become a popular choice for flooring surfaces, especially in kitchens, given that it is stain-resistant and easy on the knees and ankles. The durability of cork flooring depends on the finish used – an important consideration when choosing cork. Check out the cork flooring in our recent Claremont Kitchen remodel. Natural stone is durable and its appearance oftentimes improves with age, but can absorb stains easily. Engineered flooring is resistant to moisture and easier to install, however, it lacks durability over the long term and can only be sanded and refinished once. Easy to clean and durable tile continues to be a popular choice for kitchen flooring, with an endless variety of colors and patterns to choose from. Featuring a warm, timeless appeal, butcher block is ideal for chopping and food preparation, however, a hot pan can scorch the surface. It’s 100% natural so it’s easy to restore with regular refinishing. To add versatility and interest, we love combining butcher block with other surfaces such as granite, a combination which we installed in a recent kitchen remodel in Claremont. No longer relegated to a dull gray appearance, today’s concrete countertops can be ground, polished or stained, and are often used to create a sleek, minimalist, industrial look. With concrete, a good sealer is necessary to prevent chipping and scratching. Combining materials such as fly ash or recycled paper, composite countertops inhibit the growth of bacteria and resist stains, scratches and heat. Most are free of VOCs, do not emit radon gasses, and are food safe. These countertops are attractive but can be expensive and sometimes require sealing as well as special maintenance. Composed of hard materials, such as quartz particles, manufactured surface is gaining popularity, with good reason. Quartz countertops are attractive, scratch-, stain- and heat-resistant, and low maintenance. They also come in a variety of colors, from subtle and natural to bright and bold. That makes them the ideal choice for modern kitchen renovations or new kitchen construction. Each slab of granite is unique with no other one like it, so it’s ideal for expressing your personal taste. Granite is virtually indestructible – it can withstand hot pots and pans, and most stains are repelled. Granite requires periodic refinishing, as it can etch if acids are left on the surface. Stone countertops come in a variety of colors and styles. Like granite, each slab is unique, however, marble is softer than granite and more susceptible to scratches and chips. Still, marble is a must for the serious pastry chef due to its smooth surface and cool temperature. Naturally resistant to heat, stains and discolorations, this surface does not require sealing, is durable, and improves with age. Soapstone is more susceptible to nicks and cuts, which can easily be sanded away. Check out the slab we installed in a client’s laundry room. Check back next week to read the final post in our three-part series about kitchen design trends for 2017. When it comes to complex projects like custom homes, kitchen renovations, additions or whole-house remodeling, Lotus Construction Group uses cutting-edge materials and construction techniques, and offers innovative ideas executed with flawless precision for seamless flow and timeless design. We would love to visit your home to discuss how we might create a comprehensive Design-Build Analysis, specific to your project’s needs. If the process sounds enticing, call (909) 621-1558 today to schedule a complementary appointment. In this first part of a four-part series about kitchen remodeling, we will discuss kitchen design and color trends, and how you can incorporate color into timeless design. See our other posts on kitchen countertop surfaces & flooring, fixtures and appliances. As hokey as the saying is, the sentiment is true. The point is that whether prepping, cooking, entertaining or cleaning, the kitchen is a great spot to hang out. When entertaining, guests naturally gravitate to kitchen chairs or barstools to socialize while the host prepares the meal. Families gather in the kitchen for meal prep, homework, puzzles, lively discussions, and games. In the 1970’s earth tones like gold, almond, orange and avocado-colored appliances, bold wallpaper designs and macramé pot holders were all the rage. The 1980’s and 1990’s gave way to soft pastels, like cream with accents of mauve and teal, as well as the tropical colors. Who can forget Miami Vice? The turn of the century introduced stainless steel and professional grade appliances along with granite countertops, and steered clear of trendy colors. At Lotus, we focus on long-term and timeless designs rather than trendy ideas that will quickly date your home. However, a fresh pop of color can add interest and personality to timeless design; some examples of this can be seen in our recent kitchen remodels in Claremont featuring chalkboard back-splashes, an eye popping tile back-splash, and colorful flooring and cabinetry. Claremont featuring chalkboard back-splashes, an eye-popping tile back-splash, and colorful flooring and cabinetry. No matter your preference, painted cabinetry or natural wood, the design and detailing of the cabinetry should work in harmony with the other finishes. Our recent kitchen remodel in Pasadena incorporates custom cherry cabinetry to compliment the warm earthy tones and Tudor style of the home. We recently remodeled a mid-century ranch kitchen in Claremont using white cabinets and black countertops, which tied in beautifully with the simplicity of white subway tile and stainless steel backsplash and appliances. Check back next week to read more about kitchen design trends for 2017. When it comes to complex projects like custom homes, kitchen renovations, additions or whole-house remodeling, Lotus Construction Group uses cutting-edge materials and construction techniques we offer innovative ideas executed with flawless precision for seamless flow and timeless design. We would love to visit your home to discuss how we might create a comprehensive Design-Build Analysis, specific to your project’s needs. If the process sounds enticing, call (909) 621-1558 today to schedule a complimentary appointment.